One of the key, unique elements of the comic medium is its ability to use space to create time — check out this brilliant flip-book-style illustration of the concept by Balak 01 over on deviantArt. 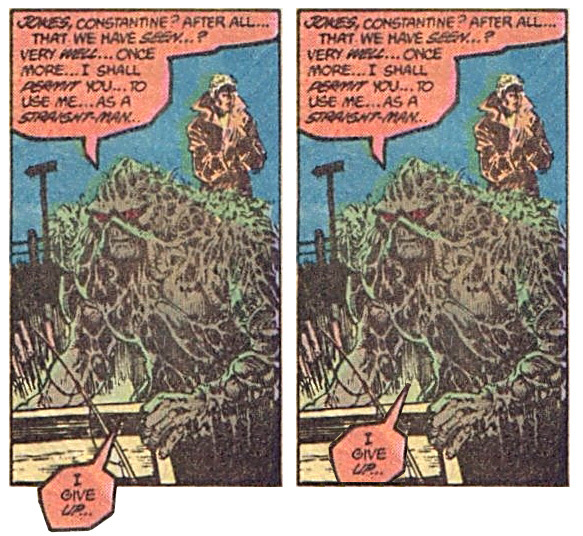 I came across a really neat illustration of this, and its relevance to lettering while looking for a sequence from Swamp Thing #51 as part of a completely different conversation. There's clearly acres of dead space within the panel to accommodate the balloon, and yet it breaks the panel borders and straddles the gutter. These are things a letterer usually avoids except when really tight for space or tackling a difficult page layout where the reading order isn't immediately obvious and it's necessary to give some extra assistance guiding the reader's eye. None of which applies here. What the floating balloon does do, however, is pull the reader's eye into the top right corner of the large bottom panel. 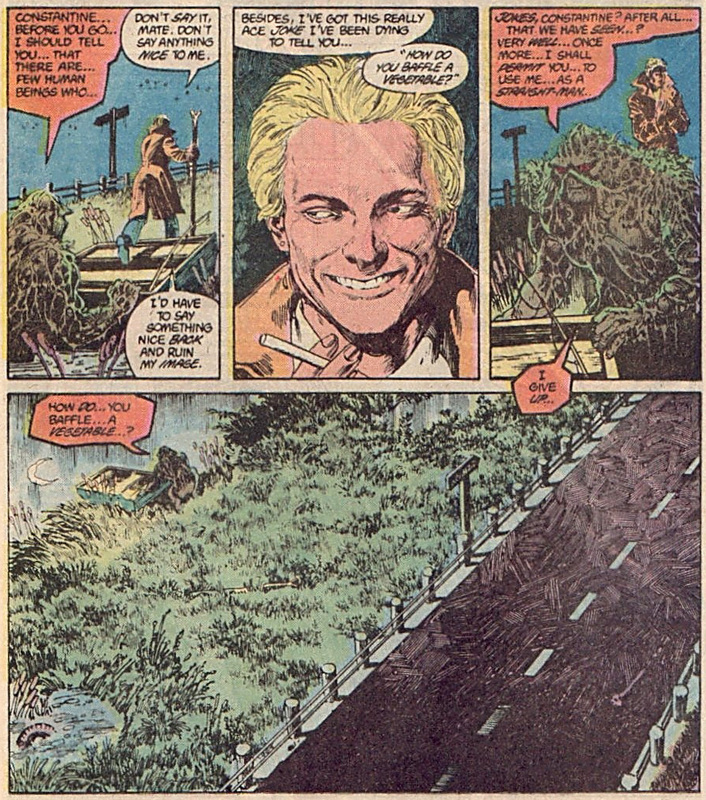 If you were reading the page normally, without the straddling balloon, your eye would automatically begin the final panel in the traditional manner, starting top left. Meaning that the first thing your eye would hit in the panel is the punchline. Instead, the balloon pulls your eye to the empty space where John Constantine should be standing, but isn't. And then your eye has to travel across the empty space to the top left corner, physically delaying the reader getting to the punchline, using space to create a pause and effectively dictating the comic timing of the joke. 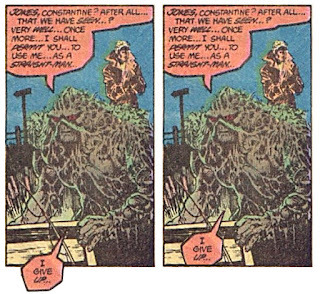 It's one tiny decision made by either the editor or the letterer, but it neatly demonstrates how small lettering choices can have significant effects on the storytelling rhythm and flow of a book. 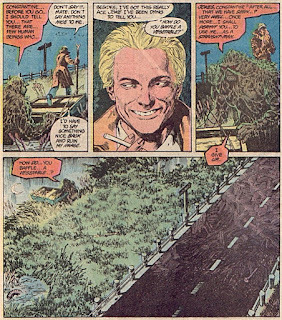 Jim Campbell is a professional comic-book letterer, one-time writer (perhaps again in the future!) and occasional artist (although his enthusiasm rather outstrips his actual ability). He knows more about print production than mortal man was meant to know and has also scanned more images than you've had hot dinners. Unless you're ninety years old.